Looking for the safest pool cover for your home or hotel? 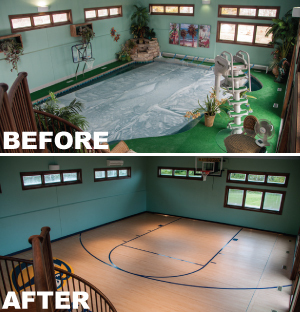 What if you could convert your pool room into a sturdy, hard-surface floor when not in use? What is the best option to reduce after-hours supervision, security and liability for your pool area? The WutPool makes converting your pool into a hard floor safe and simple. 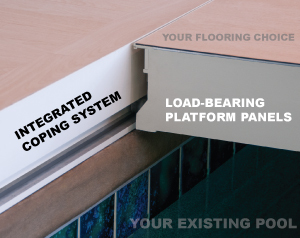 With the push of a button, load-bearing platform panels automatically cover your pool to ensure your pool is completely hidden and inaccessible. This isn’t a pool cover that stretches across your pool. The WutPool cover consists of a series of patented, custom made panels that slide over your pool and completely close it off. Each WutPool cover is manufactured to align with the ground around it in a nearly seamless manner – there are no steps to stumble upon. Opening the pool is just as easy for pool managers or parents with the key. Simply insert the key and push a button and the WutPool cover’s panels retract into a discreetly-placed racking system until you are ready to close it again. The WutPool Cover has load-bearing, retractable panels, making it the Best and Safest Pool cover available. A report issued by the U.S. Centers for Disease Control and Prevention listed drowning as the number one reason for a child under the age of 5 dying an accidental death in a number of southern states. In warm climates, more homes have outdoor swimming pools, and it is especially important to secure the pool areas when not in use. Most public outdoor pools are secured by a fence and signage restricting public access. Some public pool facilities take extra safety measures to help reduce liability by monitoring swimming pools with cameras, security patrols or by using “safety” pool covers. The WutPool cover is one extra measure for pool safety that can be implemented in residential backyard pools, hotel swimming pools and almost any type of public pool facilities. Contact us to learn more about how we are implementing the WutPool cover into homes, backyards and in facilities throughout the US and Canada.